Welcome to St. Ignace and the Eastern Upper Peninsula. From the rustic charm of Mackinac Island to the wild, scenic beauty of the Les Cheneaux archipelago and its picturesque villages of Cedarville and Hessel, to the power and majesty of the Tahquamanon Falls near Newberry, the area has something for everyone. Watch Great Lakes freighters enter the canal and lock system at Sault Ste. Marie and then witness first- hand the technological marvel as the ships navigate the 21 foot difference between Lake Superior and Lake Huron. The Upper Peninsula is uniquely positioned at the juncture of 3 of the 5 Great Lakes and St. Ignace is at the hub. The area is a celebration of these Great Waters. St. Ignace is home to some of the world's most interesting attractions. You will enjoy your visits to one-of-a-kind stops.From the imposing size and power of the Great Lakes – the Inland Seas – to the abundant rivers, lakes and streams, the St. Ignace area is an ideal venue for water enthusiasts. Kewadin Shores Casino and Hotel at St. Ignace is open 24 hours a day, 365 days a year. It is one of six successful casino properties operated in the Upper Peninsula by the Sault Tribe of Chippewa Indians. The casino includes a large gaming floor featuring slots and table games, an extensive entertainment area and an 81-room on-site hotel as well as a fine dining restaurant, a lounge, a sports bar and a deli. Other amenities include shuttle service to and from area motels, valet parking, and handicap parking. Just a short ferry ride away, Mackinac Island is generally recognized as America’s premier natural theme park. With transportation limited to horse and buggy, bicycle or foot, it has maintained the slower pace of a by-gone time. Despite this, visitors to the Island have an opportunity to participate in any number of seasonal events. St. Ignace enjoys a reputation as one of the oldest continuous settlements in the United States. Its Native American and French roots are readily evident throughout the community and it’s these deep and strong roots that form the basis for this vibrant and thriving city. Our area offers pristine beaches, boating, water activities, golfing, shopping, fishing, skiing, history, entertainment, Little Bear East Arena and more! 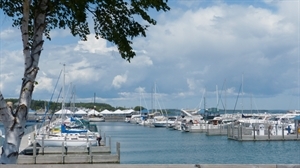 Take part in our many events such as the annual Motorized Vehicle Shows, Downtown Wine and Beer Tastings, Historic Walking Tours, Bayside Live FREE Waterfront Entertainment, Saturday Night Fireworks (July through Labor Day weekend), Sunset Boat Cruises, St. Ignace Fish Feast and Mackinac Bridge Celebrations, ferry rides to Mackinac Island, and much more. Jan 12.2 F° 18.5 F° 24.8 F° 1.7 "
Feb 11.9 F° 19.1 F° 26.4 F° 1.0 "
Mar 20.3 F° 27.6 F° 35.0 F° 1.6 "
Apr 31.9 F° 39.4 F° 46.8 F° 2.0 "
May 42.8 F° 51.3 F° 59.7 F° 2.4 "
Jun 52.9 F° 61.1 F° 69.3 F° 2.5 "
Jul 59.6 F° 67.4 F° 75.2 F° 2.7 "
Aug 59.7 F° 67.0 F° 74.3 F° 2.6 "
Sep 51.6 F° 58.6 F° 65.6 F° 3.1 "
Oct 41.6 F° 47.6 F° 53.7 F° 2.9 "
Nov 31.5 F° 36.2 F° 40.9 F° 2.4 "
Dec 20.7 F° 25.6 F° 30.4 F° 1.6 "
St. Ignace, Michigan, gets 27 inches of rain per year. The US average is 37. Snowfall is 60 inches. The average US city gets 25 inches of snow per year. The number of days with any measurable precipitation is 110. On average, there are 156 sunny days per year in St. Ignace, Michigan. The July high is around 80 degrees. The January low is 12. Our comfort index, which is based on humidity during the hot months, is a 61 out of 100, where higher is more comfortable. The US average on the comfort index is 44. Condos Over 50 Communities The median home value in St. Ignace, Michigan, is $115,500. Home appreciation is 0.10% over the last year. The median age of St. Ignace, Michigan, real estate is 45 years. Renters make up 31.51% of the St. Ignace, Michigan, population. 19.39% of houses and apartments in St. Ignace, Michigan, are unoccupied (vacancy rate).